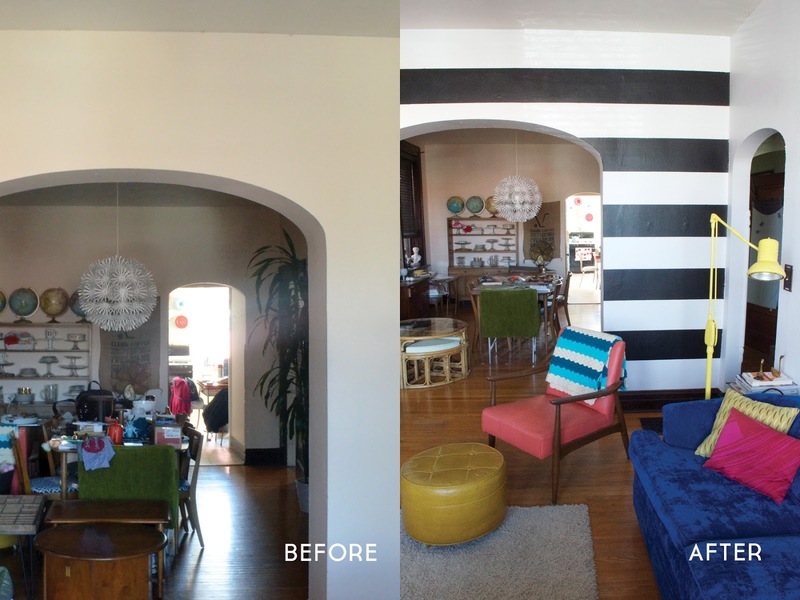 This overhaul was the manifestation of a couple things I'd been wanting to do for a while: 1) change the wall color to a bright white, and 2) make the arched wall an accent one with black-and-white stripes. One of the only downsides to living in these big beautiful brick homes in the city is that some rooms just don't get much natural light since they're sandwiches between other buildings just as tall. As such, our dining room is always very dim, and the living comes to a close second. So, I thought picking the brightest white I could find would help open the room up a bit more from the pale peachy color it's been since we moved in. The black-and-white wall is what I'm trying to make the room's "neutral" so I can try to bring all the crazy colors together that I've collected in there, most recently Big Blue — a beautiful 1960s blue velvet tufted couch I found on Craigslist some months ago. 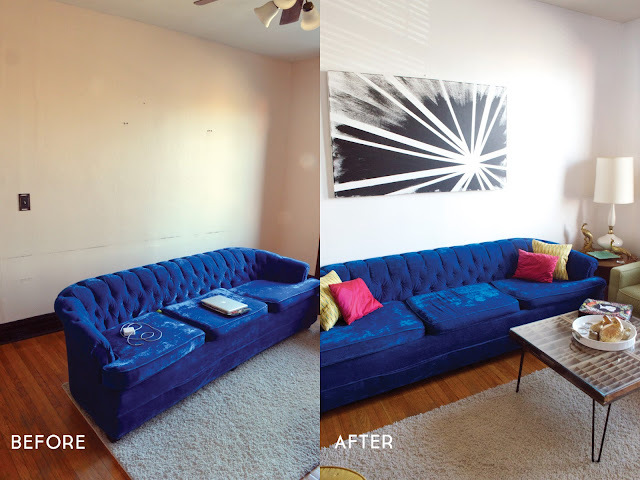 She pretty much my dream couch, so we made sure to give her a little makeover to help her last for all time, including cutting new cushions and attaching some taller feet so she'd be level with our other couch. Our other little DIY project was our new coffee table, made from two printer trays that have been sitting around the house for more than a year and some hairpin legs I poached from a side table we were going to donate to the local thrift. The hubs made a brace of 2x4s on the bottom to hold it together, and then I ordered some tabletop glass to fit on top. I couldn't be more happy with how it turned out! The only areas I'm still trying to figure are is the "bar area" in front of the brick wall and a big bunch of empty wall space in the corner to the right of Big Blue. Our bar cart is just kind of dwarfed by it, so I'd like to put toward the right and have something else balance it on the left, but can't quite figure out what. Any ideas? Or I might just try and find a bigger bar cart. We shall see. 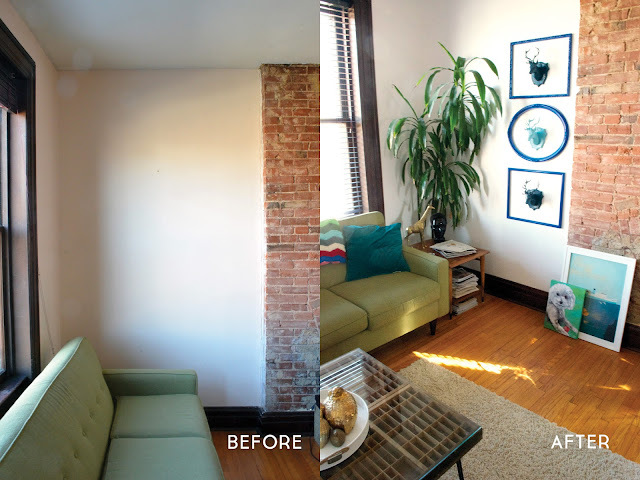 As for the wall space, I might move the black-and-white canvas to the left a little and maybe put a little collage of S's or some other kind of wall pieces on there to help take up more space. Again, we shall see. Have any of you been doing some DIY around your house lately? Would love to hear what kinds of projects you've been inspired to take on! LOVE WHAT YOU DID!! We have the same green couch? Where did you get yours? Fun! We got ours at Macy's almost two years ago. What about you?? First, that blue sofa. I die. It IS a dream sofa. 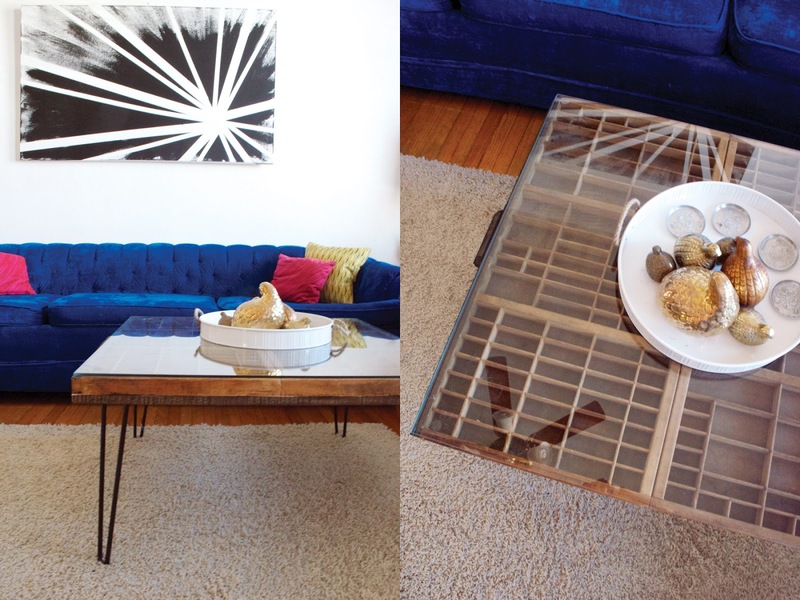 Second, I am IN LOVE with your coffee table! I LOVE the printer trays! Thanks, lady! Next time I'm in Springfield, we should do some thrifting! Wish I would have known/remembered that a couple weekends ago! 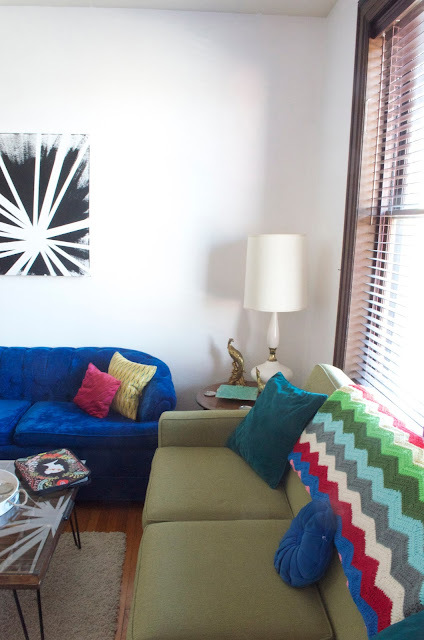 Ahhh, that blue couch! That is seriously one of the most fabulous sofas I've ever seen. for some reason, I think you should change/decorate the lampshade...maybe a bright raspberry (or the red that is in the afghan)? 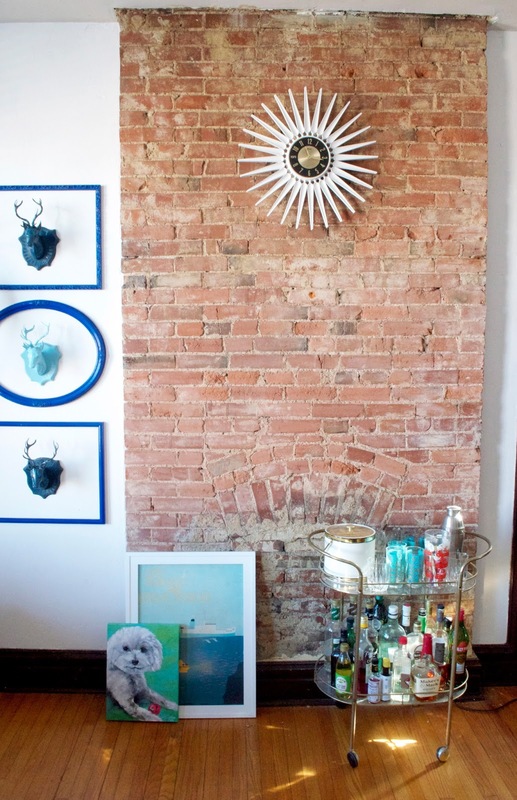 as for the brick wall...maybe build your own mantle out of salvaged wood pieces?